More impact. More income. More balance. Are you ready to launch or GROW your health, fitness, or wellness business? YOU DID IT. You made a commitment to a path of service and are building a career around helping others feel better. Way to go! 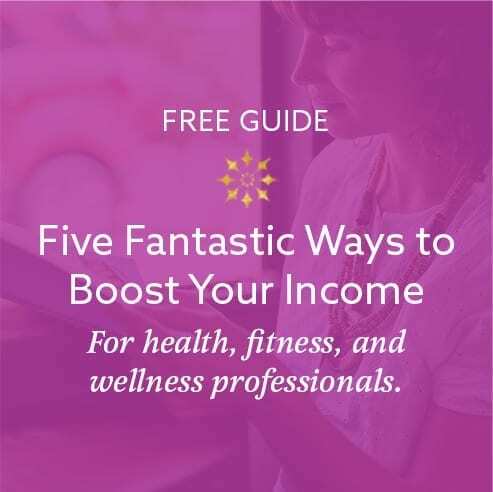 However, when you work for yourself it seems like you’re either scrambling for more clients, trying to squeeze more time out of the day, or you’ve hit an income plateau; and that can be draining. It leaves you with less energy for yourself and your clients. And with all the good work you’re doing in the world, you deserve more. Much more. You know that there’s got to be a better way. As a successful yoga therapist I know how hard it can be to grow your business without sacrificing your own self-care or sanity. I’ve been there and I get it. Since 1999 I’ve coached hundreds of people just like you—professionals who want to make a positive impact on the well being of others, do well financially, and enjoy their own lives in vibrant health. Whether you’re going through a career transition or trying to boost your income, I’ll help you clarify your goals, break down the barriers to achieving them, and develop a business model that works the way you want it to. Once these are in place, your results can start to shift. If you truly want to move your business forward, it’s time to let go of the band-aid solutions and learn how to create lasting, meaningful change. My coaching practice serves a wide range of clients — from brand newbies to seasoned practitioners — including yoga teachers, yoga therapists, nutritionists, psychotherapists, personal trainers, bodyworkers, health coaches, pilates instructors, Ayurvedic practitioners, and many more. Regardless of your modality, if you’re ready to commit to yourself, your business, and your clients, I invite you to apply for a free Discovery Session HERE. The best way to learn more about working together, and start getting unstuck now, is to schedule a 30 minute complimentary discovery session. You can also read what others have to say about working with me. Your information will *never* be shared or sold to a 3rd party. By submitting this form, you are agreeing to receive your free gift along with Laura's newsletter, marketing materials, information about courses and services and promotions.